Now in stock at Leica. We have units on the way and available for order today. I would love too see some reviews on this. I heard the SD card version was kind of a pain but this would eliminate that! There is an important highlight in the distance measurement specifications for this model. Using the same integrated ballistic curves that other Leica CRF models feature it can provide a ballistic output as far as 875 yds. 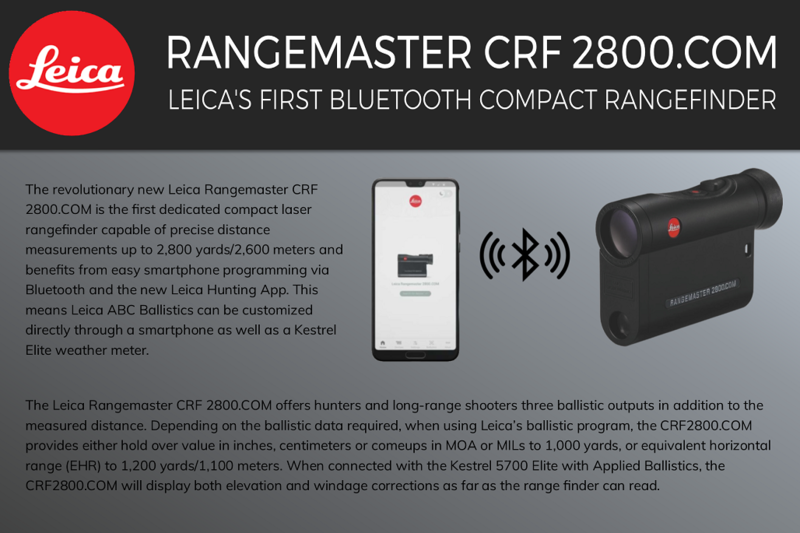 Paired with the new Leica ballistic app the ballistic output is increased to an impressive 1000 yds. The most impressive statistic comes when the CRF 2800.COM is used in conjunction with a Kestrel 5700 Elite. The CRF will display both windage and elevation out to its maximum 2800 yds. When paired with a phone will it give windage through the Leica or is that only with a kestrel?